Thank you for shopping at Schreiner's Iris Gardens! Books, gifts, catalogs and fertilizer ship year-round. Please note that your credit card will be charged when you submit your order. Cancellation Policy: A non-refundable handling fee of $5.00, plus a 3% credit card interchange fee will be charged for any cancelled order. Questions on how to place an order, contact us. CUSTOMERS OUTSIDE OF THE USA: This shopping cart is currently for use only with orders delivered to addresses in the USA. Click here to email us your order for overseas delivery. Looking for Wholesale Terms and Conditions? Click here. We use UPS or USPS for our Standard Shipping on Iris rhizome and Daylily orders. Please include a physical delivery address in your order to ensure proper delivery. Notify us if you require delivery to a postal box instead. We cannot be responsible for delivery problems due to incorrect addresses. Please check that you have provided us with the correct address and ZIP code. Shipping is based on the number and type of plants in your cart, as well as on your ship-to state. 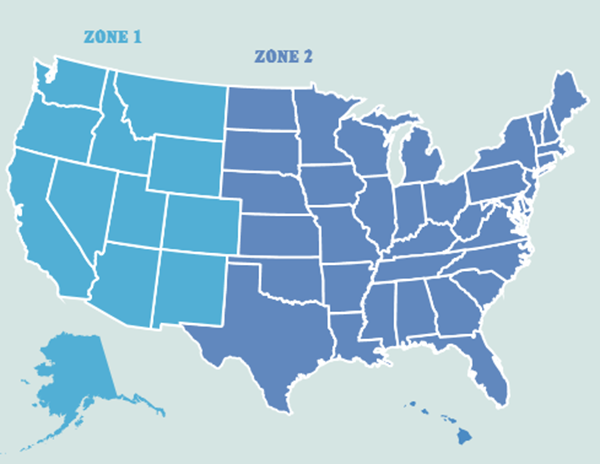 States are divided into Zone 1 and Zone 2 for purposes of shipping. PLEASE NOTE: Beardless Iris and Daylilies must be shipped SEPARATELY from Bearded Iris, and therefore incur additional handling charges. Beardless Iris: add $10.00 handling fee to the zone shipping charge. Daylilies: add $1.10/daylily, plus $10.00 handling fee for Zone 1,and $12.00 for Zone 2. NOTE: The handling fee is waived on orders containing only Daylilies. Expedited Shipping on Iris & Daylilies: Our shipping season begins mid-July. Expedited Shipping ensures that you will receive your order within a few days after it leaves our farm (typically 2 business days within the Continental US), as opposed to the Standard Shipping time of up to 7 business days. Add $2.25 for each plant to the above shipping rates. Priority Shipping: Please add $9.95 for the first book and $6.00 for each additional book for Priority shipping. With Priority Shipping, books will arrive in approximately one week from the date the shipment leaves our office . The following shipping information pertains to delivery to US Addresses ONLY. Postage for Standard Shipping & Handling is included in the price of the catalog ($5.00). We ship our catalogs via the USPS Media Rate. Please allow 2 to 3 weeks for delivery. Priority Handling: For an additional $3.00, you may request that your catalog be delivered via First Class Mail. You should receive your catalog within one week with this option.